The Museum Service cares for more than 150,000 objects, from teapots and flat irons to fire engines and prehistoric burials. As an Accredited museum service, we have policies which guide the collecting of objects and, if necessary, their disposal. We collect in several ways - by donation or gift; by purchase; by transfer from another museum; or from a legacy in a will. Once accepted into our collection, all donated objects are legally owned and insured by South Lanarkshire Council, and are cared for according to recommended museum standards. We accept objects which are connected with South Lanarkshire or The Cameronians (Scottish Rifles) regiment. costumes from any period, especially men's and children's. objects connected to sport in South Lanarkshire. Unfortunately, it is not possible for all our objects to be on display at any one time. However, most objects which are not on display can be made available for private research by appointment. If you would like to donate an object to us, please contact Low Parks Museum on 01698 452382, giving as many details about the object as possible. 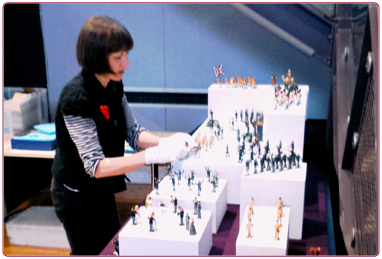 A member of the Collections team will then contact you to discuss your object. When an object is accepted into the collections, an object entry form must be completed. This transfers legal ownership of the object to South Lanarkshire Council. If an object does not meet the requirements of our collecting policy, then we may contact you to ask if you are happy for it to instead become part of our handling collections. The handling collections are a vital part of the Museum's learning programme, as they give schools, community groups and individual children and adults a wonderful opportunity to gain a direct hands-on experience with a real piece of history. We can also offer advice if you need help identifying or caring for an object or antique. However, please note that we are not able to provide valuations.